Six member "boy band" draws comparisons to Backstreet Boys, Rascal Flatts and Dan+Shay with New EP. Featured on the EP is King Calaway’s debut single “World For Two,” a track that shows the group’s sonic range by mixing groove, grit and rootsy stomp in equal doses. The song’s music video premiered on People.com this morning. King Calaway was co-produced by Ross Copperman, who also penned several of the tracks, alongside the band’s mentor, music-industry veteran Robert Deaton. The result is a body of work which captures the group’s natural sound with broad, bold strokes, emphasizing real instruments and live performances – an organic approach to a dynamic sound that allows the band's chemistry, soaring vocal melodies and consummate musicianship to shine through. Other writers on the project include fellow artists The Warren Brothers, Teddy Geiger, Mitchell Tenpenny and Devin Dawson. 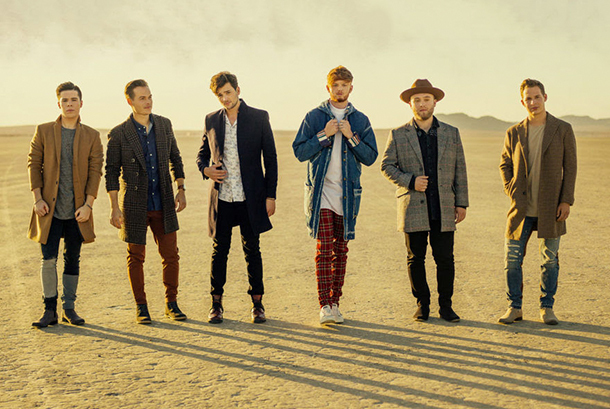 Before coming together in 2018, bandmates Jordan Harvey, Chad Michael Jervis, Simon Dumas, Chris Deaton, Caleb Miller and Austin Luther all pursued their own solo careers, racking up a long list of milestones — including American Idol golden tickets, CMA Awards performances, international tours, session gigs, and BBC TV appearances — along the way. One by one, they all chased their dreams from across the globe – from the small towns of the American Midwest to the small coastal country of Gibraltar; from the Atlantic seaboard to the Central Belt of Scotland – and found their way to Nashville, drawn to the city by its rich, diverse music scene. That diversity reaches a new peak with King Calaway. A multi-national supergroup of harmony-singing, instrument-playing musicians, the band makes anthemic country music for the modern world. Jordan, Chad and Simon all share frontman duties, backed by thick, multi-part harmonies from Chris, Caleb and Austin. The result is a layered vocal sound that nods to the band's influences, including the Eagles, Keith Urban, and Ed Sheeran. In an age when music fans listen to everything, filling their playlists with songs from every corner of the musical spectrum, King Calaway is something new and fresh: a band that both embraces its country roots and reaches far beyond them.